I hope you’re enjoying these fashion posts. Today we’re going to see what fashionable ladies would have worn in March 1832. Aren’t the ball and evening gowns absolutely gorgeous? I love the colours and the embellishments, so pretty. What do you think of them? Walking dress of gros de Naples; colour, a light shade of wood-brown. The corsage is made high, with a mantilla pelerine, which is disposed in full plaits over the bust, and confined to the at the waist by a plaited band. The of the mantilla are long, and pointed in front, but rather shorter behind. The epaulette is large, and very full, and falls a considerable way down the arm. The sleeve is of the Amadis form, and large at the top. It is corded as high as the elbow en militaire, with a rich in silk. The hem at the bottom of the skirt is cut into deep vandykes, between the points of which are inserted double-pointed leaves, falling toward the bottom of the dress. Bonnet of blue terry velvet, of the bibi shape. At the summit of the crown is a plume of three curling ostrich feathers, falling over the front. A band of rich satin ribbon passes round the base of the feathers, and is tied in a small bow behind. The brides are fastened under the chin. The hair is parted in front, and arranged in close curls on each side. Gloves of blue kid. Bottines of brown gros de Naples. Ball dress of white chalis, over pink satin. This beautiful dress has the skirt trimmed with leaves of pink satin. They are placed in close groups of six, three upward and the same number downward, at the head of a deep hem. A corded band goes round the skirt, crossing the centre of each group, and in the space between each set of leaves, the band itself is crossed en saltier by two smaller bands. 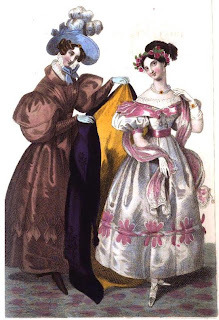 The body is made quite close to the shape, and cut low in front with a very novel and becoming cape, which is fastened before with a small bow of pink satin, and tassels of the same colour. It is cut into six tabs on the shoulder, and falls over a short and very full sleeve, finished at the elbow with a broad band of pink satin. The bust is shaded by a tucker a l’enfant, of crepe lisse; and a scarf of pink and silver tissue is thrown over the shoulders. The coiffure is simple, but well suited to the rest of the costume. The front hair is plainly braided over each temple; and the back hair is rolled in a thick, broad plait at the back part of the head. The ends of the plaits are curled, and hung a little on one side. A wreath of small roses finishes the head-dress. Earrings of gold and large pearls. Necklace and bracelets of large round pearls, with gold and jacinth clasps. Gloves of white satin. Shoes of white satin, with rosettes and sandals of silver tissue. The mantle is of marguerite satin, embroidered in silk of a deeper shade. The mantle and its cape have a broad trimming of rich velvet. The lining is of apricot gros de Naples. Carriage dress of fawn-coloured satin, made en redingote. The skirt is trimmed down each side of the front with a triple row of vandykes, diminishing in size up ward, and laid flat upon the skirt. 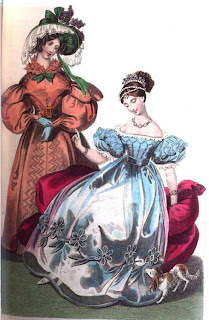 The body is made to fit the shape very closely; and over it is worn a velvet pelerine, of the same colour as the dress. It is pointed at the waist, before and behind; cut wide on the shoulder, but the fulness is partially removed from three openings made from the armhole to the neck; these openings are then laced close. The part of the pelerine which forms the epaulette is left full, and falls over the sleeve in three large scallops. Three frills of vandyked satin stand up round the throat, and are fastened in front with a row of ribbon. The sleeve is large and full, but the fulness is confined at the wrist by a deep cuff, extending considerably up the sleeve at the back part, but much hollowed out in front of the arm. Chapeau of bright green moire, lined with satin. Round the brim is a deep fall of blonde de Cambray; and inside it is a bow of ribbon, placed close to the setting-in of the crown, from which passes a loop to a similar bow rather higher on the opposite side. The crown is made to slope very much forward, and is trimmed in front with a bow of velvet, or ribbon, and three sprigs of Persian lilac. The hair is dressed in ringlets, and falls low on each side the face. Buckle of pale gold. Gloves of blue gros de Naples. An evening dress of light-blue gaze de Paris, worn over a slip of rich satin. The skirt of the dress is very wide, and is trimmed with flowers and foliage of blue velvet, edged with white satin, and set on in waves at the usual distance from the bottom. The corsage is made a la Victoire, with a narrow fall of blonde round the bust, headed by a small rouleau of white satin. The sleeve is composed of two pieces, each cut into alternate dents and hollows, which fit into each other, and form a full wreath of leaves round the sleeve. The bottom of the sleeve is plaited into a band of white satin, and finished with blonde. Ceinture of blue velvet, edged with white satin. The hair is braided in front, and gathered into a large roll of tresses at the back. A magnificent tiara of diamonds is placed on the summit of the head, and under it are seen two rows of large and costly pearls. Another row crosses the brow, having in its centre, an agraffe of pale gold, from which hang three large pear-shaped pearls. Necklace and bracelets of diamonds, and Venetian gold chain. Shoes of white satin.